As the disaster at Fukishima continues, the fallout has been as heavy in terms of the public perceptions of nuclear safety as it has on the poor people of the Eastern seaboard of Japan. Although its disappearance from the main-source news systems means that people could assume the central problems at the plant are under control; there has been a lot of disturbing news which is hidden in NGO reports which is now surfacing in whistleblowing blogs and online journals. It is partly for this reason that the groundswell of anti-nuclear opinion has forced the once -impregnable Ms Merkel into a moratorium on any further development in Germany; and the Italians have now voted decisively to reject nuclear power, along with the privatisation of the water supply, and a change in the law which would have allowed Government ministers to avoid justice. A report from the Guardian describes the effect of these results and how they will affect the ultimate fate of Berlusconi’s everlasting regime . . . 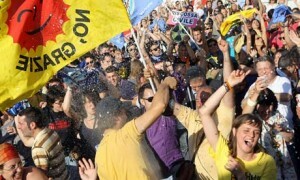 The result represented an overwhelming setback for the prime minister, who had tried to thwart the outcome by discouraging Italians from taking part. The referendum needed a turnout of at least 50% to be binding. Interior ministry figures projections indicated that more than 57% of the electorate had taken part. Greenpeace called it a historic result. Quorums were also reached in three other referendums held simultaneously – the first time in 16 years that a quorum had been achieved in any referendum in Italy. Official projections showed more than 95% of voters rejecting water privatisation and a law allowing Berlusconi and other ministers to cite government business as a reason for delaying trials in which they were defendants. The expected majority against nuclear power was 94% . . . . (Berlusconi) first ran into serious trouble on 30 May when his candidate for mayor of Milan lost in a local election runoff. Milan is Berlusconi’s home city and traditionally a weather-vane accurately pointing to Italy’s future political direction. 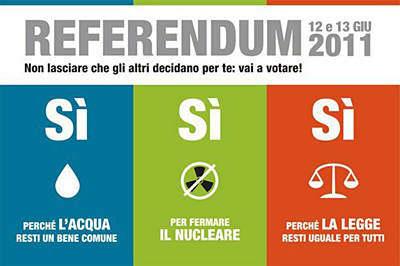 Italy abandoned its nuclear programme following a similar referendum in 1987. The government of the day opted to phase out all the country’s existing plants. The last one shut down in 1990. Berlusconi had planned to generate a quarter of Italy’s electricity with French-built nuclear plants. Construction of the first was due to start between 2013 and 2015. Let’s hope that democracy prevails, and the ever-wily Berlusconi – a corporate frontman since his early days in the P2 Lodge – doesn’t help facillitate the sort of crisis which allows these results to be reversed . . .
P2 was sometimes referred to as a “state within a state” or a “shadow government“. The lodge had among its members prominent journalists, members of parliament, industrialists, and military leaders—including Silvio Berlusconi, who later became Prime Minister of Italy; the Savoy pretender to the Italian throne Victor Emmanuel; and the heads of all three Italian intelligence services . . . . When searching Licio Gelli’s villa, the police found a document called the “Plan for Democratic Rebirth”, which called for a consolidation of the media, suppression of trade unions, and the rewriting of the Italian Constitution. You are currently browsing the archives for the Freemasons category.